Relatives to peaches, apricots are small, golden orange fruits with soft velvety skin varying in color from pale yellow to deep orange with a hint of pink blush. Their smooth flesh offers a honey-sweet flavor with slightly tangy juice. Some describe their flavor as almost musky, with a faint tartness that lies somewhere between a peach and a plum. 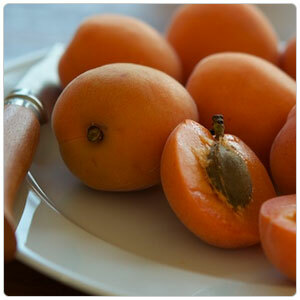 Apricots do not improve in flavor once picked and must be ripened on the tree. Apricots can be frozen into ice creams, baked into pies, tarts, cobblers, and cooked down for jam and compotes. They also make excellent condiments for grilled or roasted meats. Apricots were brought to the New World by Spanish Missionaries and today, almost all apricot production in the U.S. comes from small family farms in the San Joaquin Valley of California. They are often crossed with plums to provide pluots (mostly plum), plumcots (equal plum and apricot) and apriums (mostly apricot).